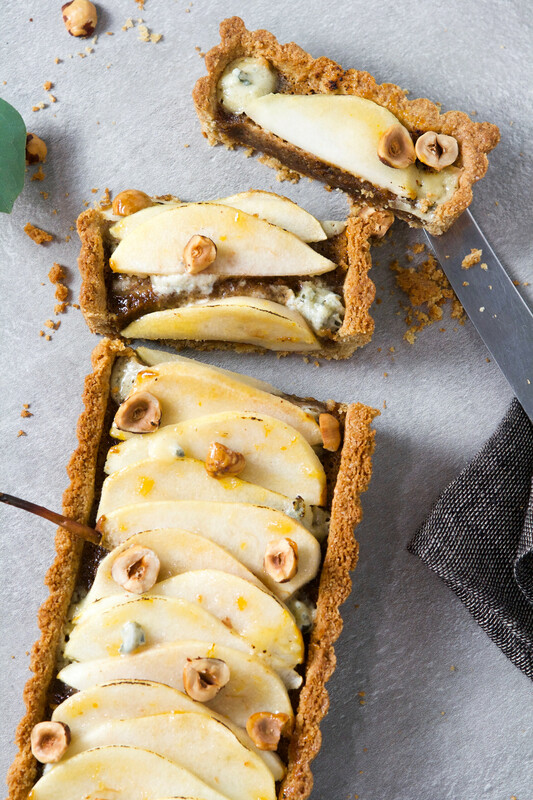 This Pear, Hazelnut and Blue Cheese Tart has everything going for it. It’s nutty, lightly sweetened, and just a touch of salty, making it a perfect treat to finish off any meal. I’m often in charge of desserts for Thanksgiving and the menu usually includes my apple, pear, and cranberry pie, a pumpkin pie, and some sort of wildcard dessert. The past few Thanksgivings a flourless chocolate cake or an apple tart have been the wild card. But with Thanksgiving being a bit smaller this year, I’m planning to make just one dessert instead of three. I’ve been looking for a dessert that festive, seasonal, and special enough for a holiday. And you can’t really choose between pumpkin or apple pie, can you? 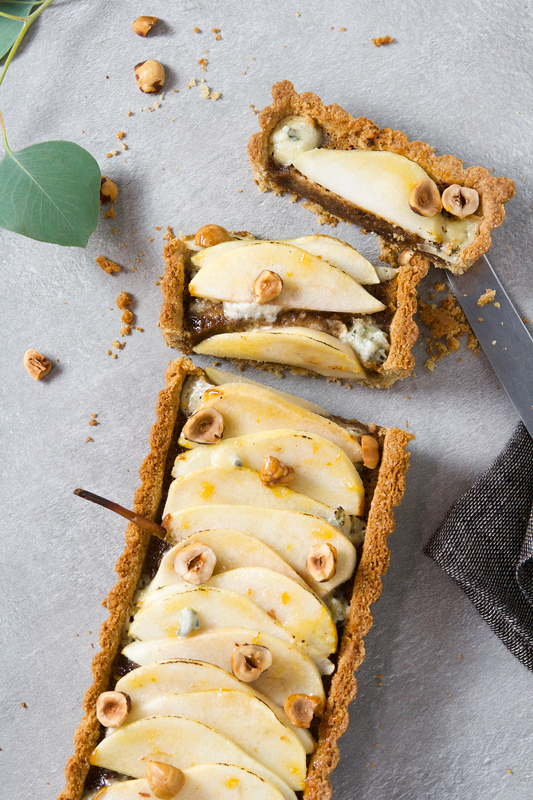 This pear tart fits the bill all around. It’s timely and unique while being different enough to make a statement. As a nod to health, but more so for it’s nutty flavor and texture, I make a whole-wheat crust. If you don’t want it to be 100% whole wheat, you could easily swap out a quarter or even a half of the whole-wheat flour for all purpose. 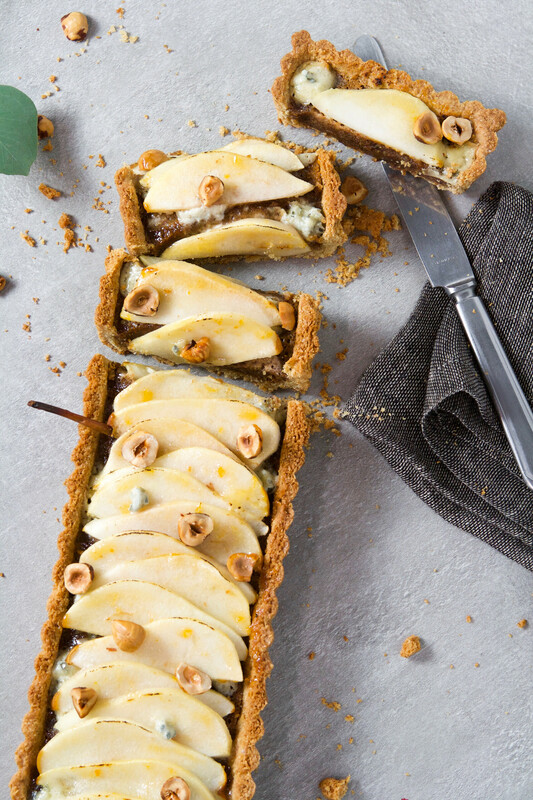 The rest of this tart is pretty straight forward, which mean you can easily whip this up in time for Thanksgiving! Whisk together egg yolk, milk, and vanilla; set aside. Pulse flour, confectioner’s sugar, salt, and cardamom in a food processor to combine, about 5 pulses. Sprinkle butter over flour mixture and pulse until mixture resembles coarse crumbs, about 20 pulses. With processor running, add yolk and milk mixture and process until dough comes together, 15–20 seconds. 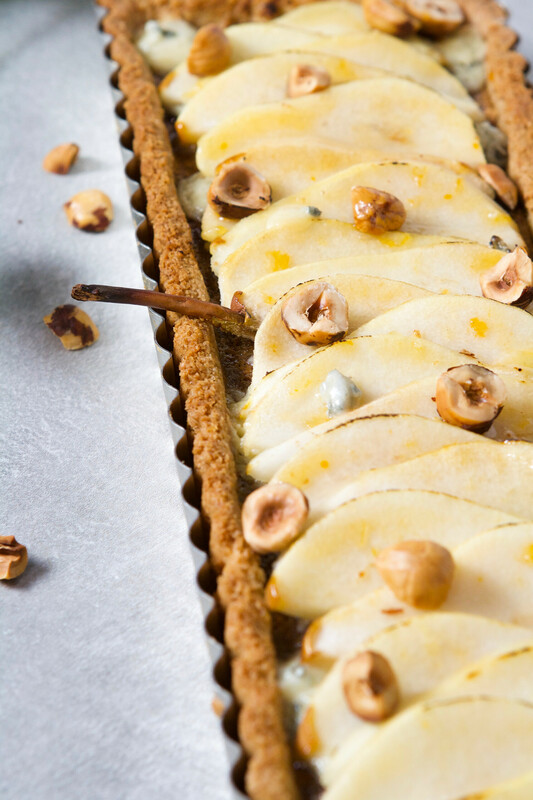 Press dough into the bottom and up the sides of a 4×13-inch tart pan with removable bottom. Cover with plastic and refrigerate at least 1 hour or up to 2 days. Process hazelnuts in a food processor until coarsely ground, about 15 seconds. Add sugar and process 20 seconds. Add egg, egg white, butter, vanilla and salt and process until smooth, about 30 seconds. Transfer to a bowl and chill until ready to use. Adjust oven rack to the lower-middle position and heat oven to 375℉. Meanwhile, transfer chilled tart shell to freezer until oven is ready (about 30 minutes). Set frozen tart shell on a baking sheet. Lightly spray a large piece of foil with nonstick spray. Fit foil pieces, greased side down, tightly against frozen tart shell, letting excess hang over sides. Fill foil-lined tart shell with dried beans or pie weights and bake until crust is set and just starting to brown, 25 minutes. Remove foil and weights and bake crust until dry and golden brown, another 5–8 minutes. 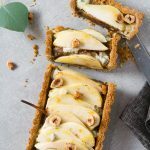 Spread hazelnut filling evenly over tart shell and bake until set, about 20 minutes, shielding crust edges if starting to brown too much. 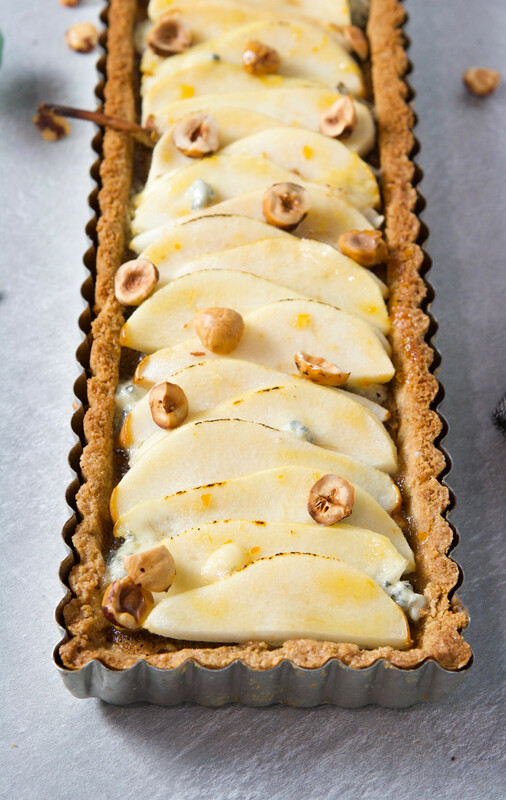 Remove tart from oven and sprinkle 2 tablespoons blue cheese evenly over filling. 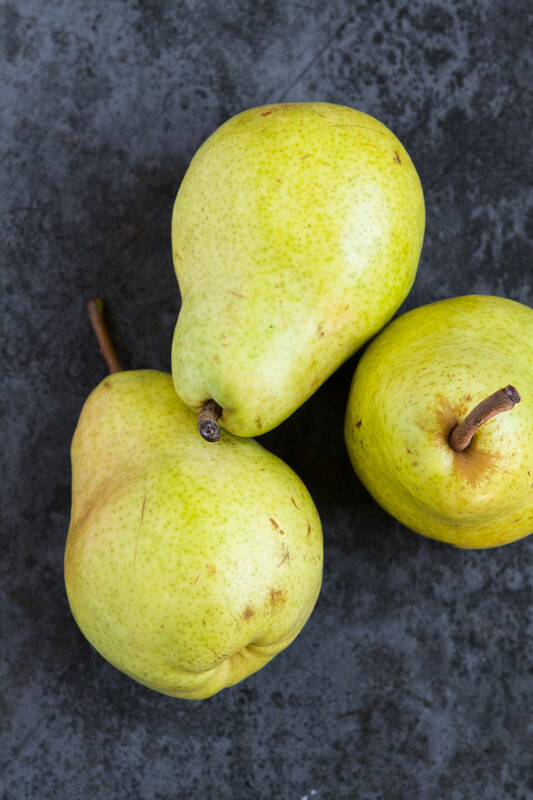 Gently toss pears with 2 tablespoons lemon juice then arrange pear slices on top of cheese and filling, slightly overlapping. 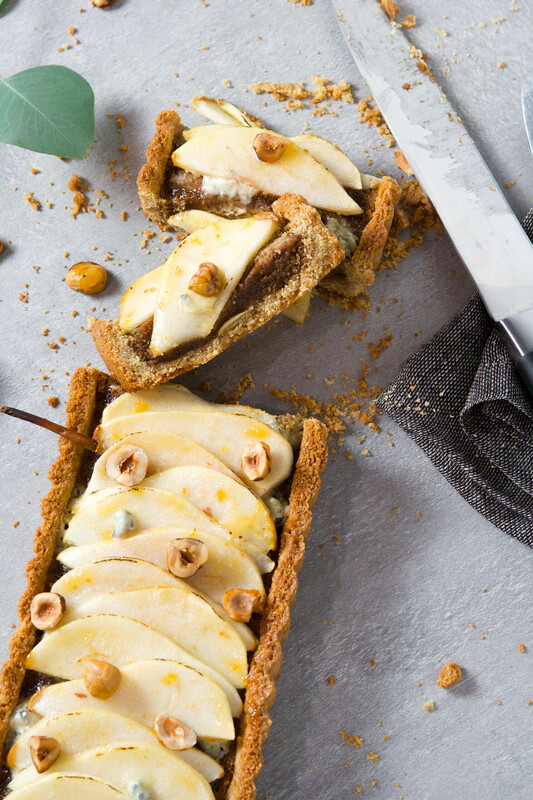 Bake tart until pears are fork-tender, about 25 minutes. Combine apricot jam and remaining 1 teaspoon lemon juice, microwave for 20 seconds on high; whisk to combine. 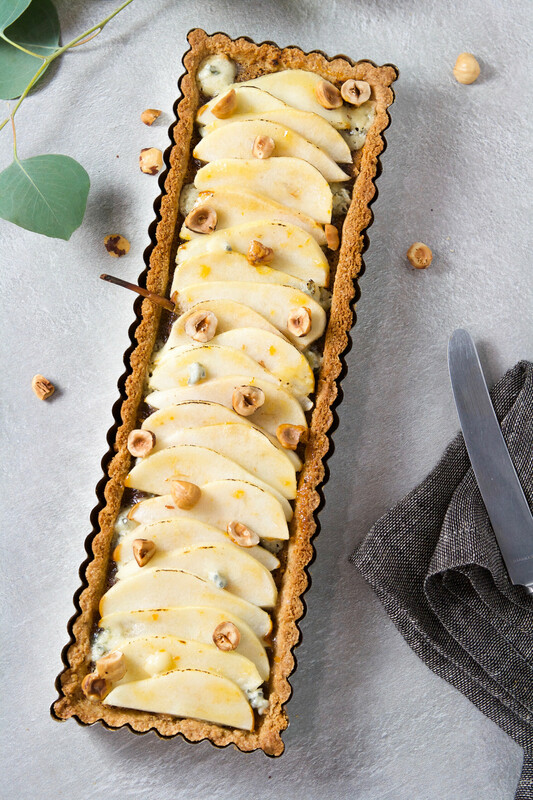 Remove tart from oven and brush pears with glaze, sprinkle with additional cheese and hazelnuts. Cool completely in pan before unmolding and cutting. I broiled mine for just 1 minute or so after brushing the pears with glaze. This step is totally optional, I just liked the added color. Dough for the crust can be made up to 1 month ahead and frozen. Either form dough into a disk, double wrap in plastic wrap and layer of foil and freeze, then thaw and roll out before pressing into pan. Or you can press the dough into the pan, double wrap with plastic wrap and a layer of foil, then just fill and bake when ready to use. This looks perfect for any holiday table! Pinned this twice!